Anthony Brunelli Fine Arts of Binghamton, N.Y. will feature a section dedicated to photorealist painting and hyperrealist sculpture. 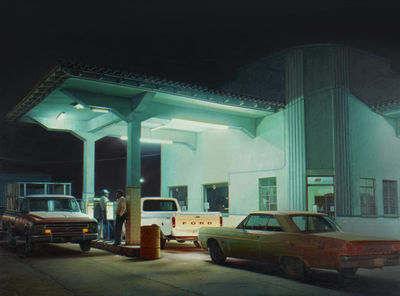 These will include Robert Gniewek’s 2016 oil Pemex Station, Agua Prieta, a Hopperesque night depiction of a gas station. ArtPalmBeach is keeping up with the times. That’s what organizer Lee Ann Lester says. “Fairs must reflect today’s culture of more immersive experiences,” said Lester, who teamed up with guest curator Erich Weiss to provide such experiences. The fair will open its 22nd edition with a by-invitation preview tonight and run through Sunday at the Palm Beach County Convention Center in West Palm Beach.